Live pig hanging machine is one live pig transporting equipment ,which is convenience to use the shackle chain to shackle the pig leg during the slaughtering live pig.. Speed reducer,guard rail,driving chain wheel,rack,transporting blet and driven chain wheel constitute this machine. Feature of the equipment: It is convenient to shackle the pig let to lift and guard the operator’ safety . The waiting-to-be -slaughtered pig will enter into the equipment through the driving the pig passage.In the equipment the pig’s legs will be hanging in the air and can’t be moved, which is convenience for the shackle chain to shackle one of the hindleg to hang into the bloodletting transporting machine for killing and bloodletting. ZBHT Slaughtering Machinery Co.,Ltd. manufacturing high-quality Live Pig Shackling Conveyor and supply OEM, ODM service according to your personal requirement. 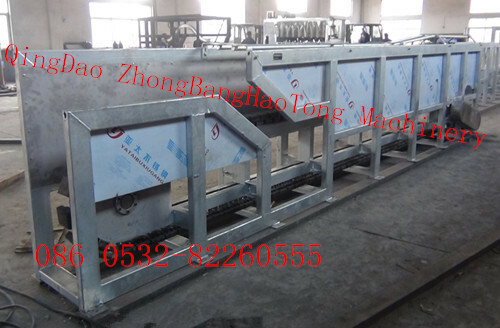 Our Live Pig Shackling Conveyor and other Pig Slaughtering Equipment is not only good in quality but also competitive in price, welcome to inquiry us about the details of Live Pig Shackling Conveyor or other slaughtering machine products and accessory equipment.